This powerful little berry has 10 times the antioxidants of grapes and twice that of blueberries. It is now classified as a super food! I understand that an unsweetened pulp is now available, which is best form of acai to take. 3.5 ounces of the acai berry is also loaded with amino acids, dietary fiber and mono-unsaturated fats. If you Google the acai berry, your search will return about 3 million results. There is no question about the power of this little berry other than which brand to buy. Amazon Thunder gave some great product comparisons on their website; but please do your own search and see what works for you. 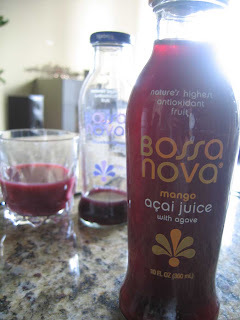 Most grocery and whole food stores not stock some form of the acai berry, I picked up this bottle of juice at Dominick's. Be forewarned that this is not a cheap product and keep an eye on the ingredients, many juices can be loaded with sugar! But if these powerful antioxidants keep me from being bed ridden with sickness, help with energy, diabetes, arthritis, sexual drive and help my skin and digestive systems and tastes great, then it's worth the price to me. Let me know if the acai berry helps you and remember, take your antioxidants and be fat and happy! Thank you for sharing the information about Acai Berry. These berries originates from Brazil and have been sold all over the world. It is very easy to buy Acai Berry Juice from online stores at affordable price and take advantage of its various health benefits. The Acai palm is a tree belongs to the genus Euterpe and includes eight various species of palm tree, all of which are native to South and Central America, from Peru to Brazil and up to Belize.